Starting next month, American Film will relocate to AFI.com. Right now, we're prepping a new and improved version of American Film™ that will better serve you, our faithful reader. We'll continue to post pieces about movies (and also television) from the past and present, offer up exclusive interviews and videos, interactive games and a lot more. Look for more varied and frequently published articles, too. Plus, you'll be able to comment and interact more fully as the community that you are: those who appreciate good storytelling. See you on AFI.com on November 1. AFI FEST presented by Audi, which celebrates its 28th year, is just one month away. The festival will take place in the heart of Hollywood, California, at the historic TCL Chinese Theatre, the Chinese 6 Theatres, the Egyptian Theatre and the Hollywood Roosevelt Hotel from November 6–13, 2014. Featuring nightly Galas, special screenings and filmmaker Q&As, AFI FEST will continue its unprecedented offer of free tickets to all screenings, with AFI members being the first to reserve tickets. Only attendees who purchase the Star Patron and Marquee Patron Packages will be provided with reserved seating at the world premiere Opening Night Gala of A MOST VIOLENT YEAR on November 6. The film is written and directed by Academy Award® nominee J.C. Chandor and stars Oscar Isaac and Academy Award® nominee Jessica Chastain. Those who purchase those two Packages will also be provided with reserved seating for the Tribute to Sophia Loren on November 12, which will include a conversation with Loren about her illustrious career. Remember, AFI members at the Two-Star level and higher receive a 10% discount on all Patron Packages and Passes. The American Film Institute is a 501(c)(3) non-profit educational and cultural organization; Patron Packages and Passes are tax-deductible to the full extent of the law. Click here to find the pass that is right for you! 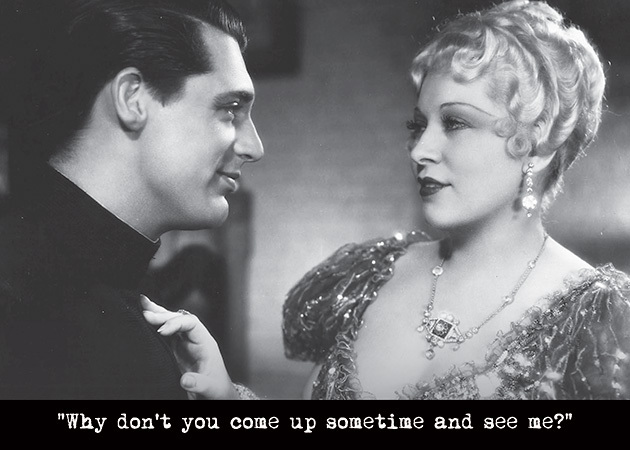 AFI members received a handsome set of notecards, featuring several quotes from AFI's 100 Years...100 Movie Quotes, our list of greatest movie quotes of all time. The set of 10 cards and matching envelopes replaces the annual movie calendar members have received as a benefit in the past. The response to these original notecards has been overwhelmingly positive. AFI members will receive a new set in August 2015. #1 on AFI's 100 greatest movie quotes of all time. #5 on AFI's 100 greatest movie quotes of all time. 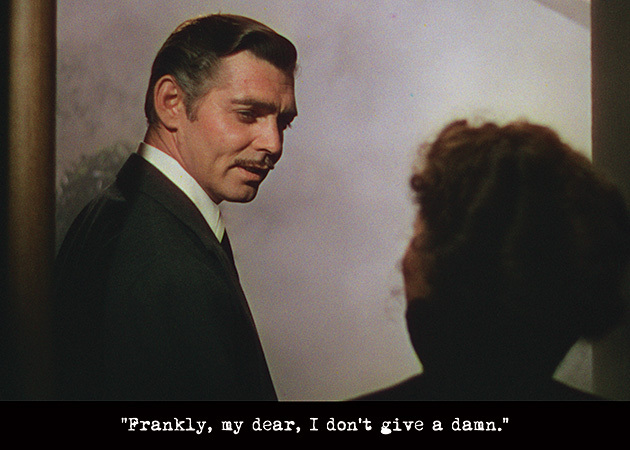 #6 on AFI's 100 greatest movie quotes of all time. #11 on AFI's 100 greatest movie quotes of all time. 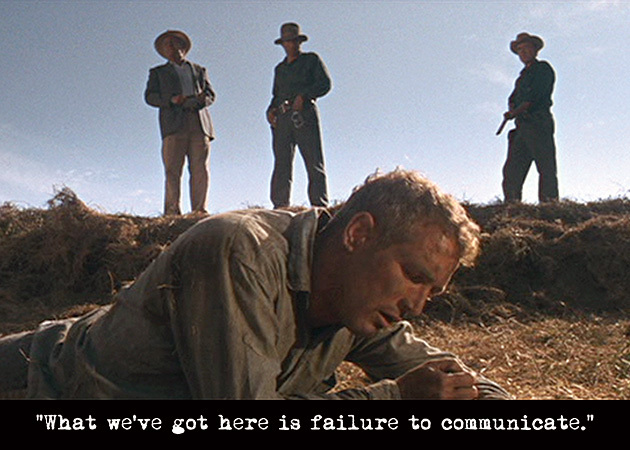 #26 on AFI's 100 greatest movie quotes of all time. AFI members save 10% on Variety's "Entertainment & Technology Summit" on October 20, 2014 at The Ritz-Carlton Hotel, Marina Del Rey, CA. (Discount Code: 10AFI). Don't miss out on the keynote conversation with James Gunn, director/screenwriter of Marvel Studios' GUARDIANS OF THE GALAXY (2014). "From independent professional producers like Roger Corman to intrepid first-timers (and sometimes only-timers) assembling a small crew and making a movie on their own terms, American independent filmmaking has a long, honorable tradition of low-budget scares." "John Waters can’t believe anyone would assemble a retrospective of his work, let alone New York City’s prestigious Film Society of Lincoln Center. It’s a tribute so unimaginable to the man whose transgressive cinema shocked midnight-movie audiences in the 1970s, and continues to drop jaws today, that it makes him quiver. 'It’s so respectable!' he exclaims." "AFI DOCS advisory board member Werner Herzog is scheduled to appear in the next season of PARKS & RECREATION. Herzog revealed that he recently filmed a 'tiny cameo' for the NBC show as 'an elderly guy who sells his decrepit house.'" "Lord (Richard) Attenborough will be remembered for his compassion, imagination and, most of all, his humility. 'I have no interest in being remembered as a great creative filmmaker,' he once said. 'I want to be remembered as a storyteller.'" We managed to pull Ellen O'Brien away from her editing suite where we usually find her hard at work cutting and piecing together video footage. We found a quiet place on campus to find out more about her and the video magic she weaves on a daily basis at AFI. The always smiling Ellen happily answered any and all of the questions we tossed her way. We learned more about where she grew up, her former life as a college DJ and, of course, which film is her all time favorite. The answer to that last question is a little gem starring Macaulay Culkin which just happens to take place in Ellen's hometown. What do you do at AFI? I am the Production Coordinator for AFI Productions. I edit a lot of the non-televised projects that AFI Productions works on. I also research and assist the director and production manager on the televised shows. What are you working on today? I’m updating the alumni reel that will play at opening day for the Conservatory by adding new films and TV shows that AFI alumni have worked on. How long have you been at AFI? Eight months. What’s been your most memorable moment at AFI over those past eight months? Hands down the AFI Life Achievement Award. It was hard work and the team put in a lot of long hours leading up to the event, but seeing the end product of the show and event was very exciting. I took my Dad to the event, and he was so excited and star struck and proud. It really just made me see the bigger picture of the work that I work on every day. I am very proud to have worked on that show. Which upcoming AFI events are you looking forward to the most? Definitely AFI FEST. I am in the process right now of researching a bunch of films for FEST and discussing some of the content our department will produce for the event. In that process, I learn so much about the filmmakers and the talent that will be featured at the festival. That’s really exciting for me because it’s like going to film school again and encourages me to brush up on films that I maybe, in my day-to-day life, wouldn’t seek out to watch. What did you do before you came to AFI? I produced a feature documentary last summer, and supervised post production throughout the fall. Before that I was the creative executive at a small production company. And before that I was an AD and production assistant on various indie productions. Where did you grow up? I grew up in Chicago, Illinois. Downtown Chicago, not to be confused with the Chicagoland area. What don’t your colleagues know about you? I was a DJ for my college radio station. I hope that there are no recordings of that floating around anywhere. It’s really embarrassing. What is your favorite movie? I thought about this before and it’s going to be impossible to choose one. The movie that I reference the most and that I’ve seen the most times is HOME ALONE. So I think whenever I’m asked that question, I answer with HOME ALONE knowing that there a lot of films that are held in higher regard. But I think growing up in Chicago and coming from a big family, I definitely relate with that movie. It’s just genius. Who would you cast to play yourself in the film story of your life? The Bollywood actress Kajol. That way, when there is a scene about me feeding my cat, it would be an epic song and dance. That would make my life story seem interesting. 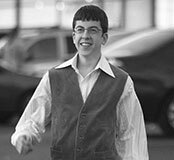 What color is McLovin's vest in SUPERBAD? "The nuns taught us there were two ways through life - the way of nature and the way of grace. You have to choose which one you'll follow." Correct! Terrence Malick (AFI Class of 1969) wrote and directed the 3-time Oscar®-nominated film. The 2011 experimental drama also won the Palme d'Or, the highest prize awarded at the Cannes Film Festival. Incorrect. The correct answer is THE TREE OF LIFE. Terrence Malick (AFI Class of 1969) wrote and directed the 3-time Oscar®-nominated film. The 2011 experimental drama also won the Palme d'Or, the highest prize awarded at the Cannes Film Festival. 10.28.14: IT’S JULIA ROBERT’S BIRTHDAY! LET’S CELEBRATE WITH A SCREEN TEST! In which two films does Julia Roberts play an art historian? Correct! In order to prepare for her role, Roberts observed art history classes at New York University. Incorrect. The correct answer is EVERYONE SAYS I LOVE YOU and MONA LISA SMILE. In order to prepare for her role, Roberts observed art history classes at New York University. Correct! The 1993 romantic dark comedy crime film was scripted by Quentin Tarantino and directed by Tony Scott. Incorrect. The correct answer is TRUE ROMANCE. The 1993 romantic dark comedy crime film was scripted by Quentin Tarantino and directed by Tony Scott. 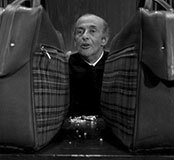 What color are the plaid overnight bags at the center of Peter Bogdanovich's 1972 screwball comedy, WHAT'S UP DOC?, starring Barbra Streisand and Ryan O'Neal? Henry Fonda (1905–1982) personally asked Sidney Lumet to direct the 1957 drama. 10.23.14: IT’S ANG LEE’S BIRTHDAY! LET’S CELEBRATE WITH A SCREEN TEST! For which two films did Lee win Best Director Oscars®? Correct! Lee also won the Best Foreign Language Film Oscar® for CROUCHING TIGER, HIDDEN DRAGON. Incorrect. The correct answer is BROKEBACK MOUNTAIN and LIFE OF PI. Lee also won the Best Foreign Language Film Oscar® for CROUCHING TIGER, HIDDEN DRAGON. Correct! Carrey based Ace Ventura’s manner and voice on one of his own characters from his early years performing stand-up comedy. Incorrect. The correct answer is Jim Carrey in ACE VENTURA: PET DETECTIVE. Carrey based Ace Ventura’s manner and voice on one of his own characters from his early years performing stand-up comedy. 10.21.14: IT’S CARRIE FISHER’S BIRTHDAY! LET’S CELEBRATE WITH A SCREEN TEST! In which film did she write her own cameo appearance? Correct! Fisher plays former actress Bianca Burnette in this third installment of the popular slasher series. Incorrect. The correct answer is SCREAM 3. Fisher plays former actress Bianca Burnette in this third installment of the popular slasher series. "I wouldn't go so far as to call a dog filthy but they're definitely dirty. But, a dog's got personality. Personality goes a long way." Correct! 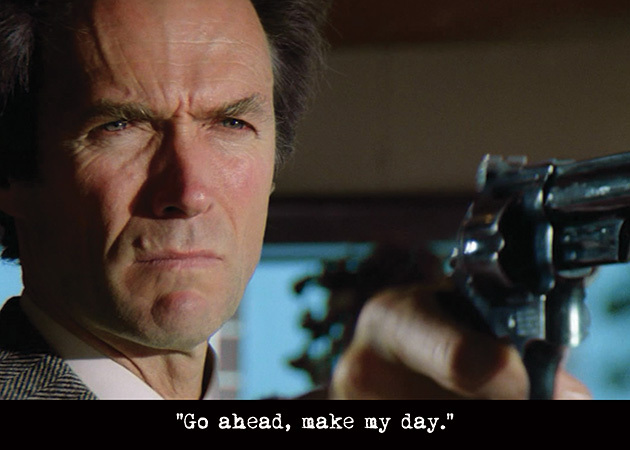 Samuel Jackson delivers the line in Quentin Tarantino's 1994 dark comedy crime film. Incorrect. The correct answer is PULP FICTION. Samuel Jackson delivers the line in Quentin Tarantino's 1994 dark comedy crime film. Laura Linney received a Bachelor of Fine Arts degree from Brown University and went on to study acting at the Julliard School. 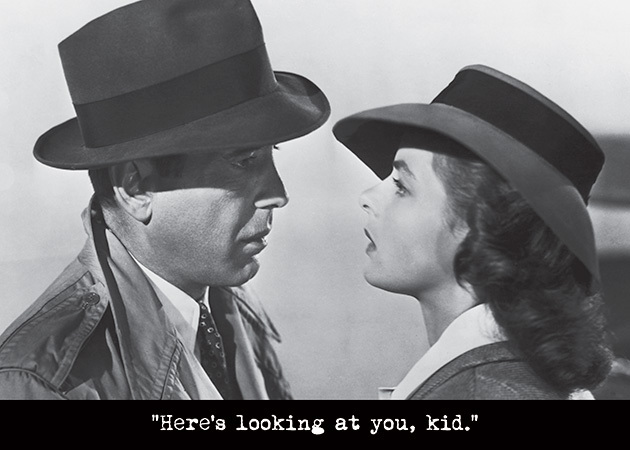 She has been nominated for an Academy® Award three times for her work in YOU CAN COUNT ON ME, KINSEY and THE SAVAGES. 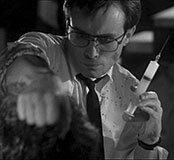 What color is Herbert West's reanimating agent in RE-ANIMATOR? 10.16.14: IT’S ANGELA LANSBURY’S BIRTHDAY! LET’S CELEBRATE WITH A SCREEN TEST! In which film did she play a role that was later played by Meryl Streep in its remake? Correct! Angela Lansbury was thirty-six at the time of filming, only three years older than Laurence Harvey, who played her son. Incorrect. The correct answer is THE MANCHURIAN CANDIDATE. Angela Lansbury was thirty-six at the time of filming, only three years older than Laurence Harvey, who played her son. Correct! Woody Allen delivered the line in his 1977 film, ANNIE HALL. Incorrect. The correct answer is Alvy Singer (Woody Allen). Allen delivered the line in his 1977 film, ANNIE HALL. 10.14.14: IT’S ROGER MOORE’S BIRTHDAY! LET’S CELEBRATE WITH A SCREEN TEST! In which of the seven James Bond films he made, did Moore become the oldest actor to ever play the role? Correct! He was 57 years old in the 1985 film. Sean Connery was 52 when he last played Bond in NEVER SAY NEVER AGAIN. Incorrect. The correct answer is A VIEW TO A KILL. He was 57 years old in the 1985 film. Sean Connery was 52 when he last played Bond in NEVER SAY NEVER AGAIN. Benjamin Bratt, a California native, did not show an interest in acting till after he graduated from college. He played the aristocratic and unemotional Dr. Juvenal Urbino in the epic LOVE IN THE TIME OF CHOLERA. 10.12.14: IT’S HUGH JACKMAN’S BIRTHDAY! LET’S CELEBRATE WITH A SCREEN TEST! In which film does Jackman play a hero who lives in a sewer system? Correct! Hugh Jackman also voiced the screams for the slug that Roddy first meets in the sewer. Incorrect. The correct answer is FLUSHED AWAY. Hugh Jackman also voiced the screams for the slug that Roddy first meets in the sewer. What color is Bruce Campbell's shirt in THE EVIL DEAD (1981)? "I met this six-year-old child, with this blank, pale, emotionless face and, the blackest eyes...the devil's eyes." Correct! Donald Pleasence delivered the line as Dr. Sam Loomis. Incorrect. The correct answer is HALLOWEEN. Donald Pleasence delivered the line as Dr. Sam Loomis. 10.8.14: IT’S MATT DAMON’S BIRTHDAY! LET’S CELEBRATE WITH A SCREEN TEST! In which film does Damon’s character say "You never meet anybody that thinks they're a bad person." Correct! THE TALENTED MR. RIPLEY also stars Jude Law, Gwyneth Paltrow and Cate Blanchett. Incorrect. The correct answer is THE TALENTED MR. RIPLEY. The film also stars Jude Law, Gwyneth Paltrow and Cate Blanchett. What story element do the following three films have in common? Correct! 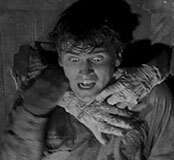 Other notable films involving cults or sects include ELMER GANTRY, THE VILLAGE and FIGHT CLUB. Incorrect. The correct answer is a cult. Other notable films involving cults or sects include ELMER GANTRY, THE VILLAGE and FIGHT CLUB. Name the actor who said the following line: "You can't fool me! There ain't no Sanity Claus!" Correct! Chico says the line in A NIGHT AT THE OPERA. Incorrect. The correct answer is Chico Marx. Chico says the line in A NIGHT AT THE OPERA. 10.5.14: IT’S KATE WINSLET’S BIRTHDAY! LET’S CELEBRATE WITH A SCREEN TEST! In which film was her first screen kiss? Correct! The film tells the story of the shocking 1954 Parker–Hulme murder case in Christchurch, New Zealand. Incorrect. The correct answer is HEAVENLY CREATURES. The film tells the story of the shocking 1954 Parker–Hulme murder case in Christchurch, New Zealand. What do the following three films have in common? Correct! Other notable films without a musical score include ANNIE HALL, NO COUNTRY FOR OLD MEN and DOG DAY AFTERNOON. Incorrect. The correct answer is no musical score. Other notable films without a musical score include ANNIE HALL, NO COUNTRY FOR OLD MEN and DOG DAY AFTERNOON. Correct! Ginger Rogers delivers the line in 42ND STREET. Incorrect. The correct answer is Ginger Rogers. Ms. Rogers delivers the line in 42ND STREET. 10.1.14: IT’S ZACH GALIFIANAKIS’ BIRTHDAY! LET’S CELEBRATE WITH A SCREEN TEST! In which film does he play Humpty Dumpty? Correct! Galifianakis plays the film's villain, versus Antonio Banderas' hero, Puss in Boots. Incorrect. The correct answer is PUSS IN BOOTS. Galifianakis plays the film's villain, versus Antonio Banderas' hero, Puss in Boots.